HERO SCREEN USED BOXING ROBE AND SHORTS. A rare chance to own a museum quality instantly recognizable Hollywood prop/costume. Original one of a kind screen used blue and white robe and shorts, worn by Mr. T in his starring role as the mighty Clubber Lang in the 1982 film Rocky III. 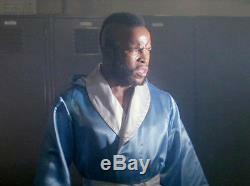 HERO CLUBBER LANG BOXING ROBE. 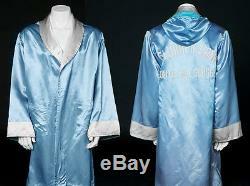 T's iconic blue and white screen used Rocky III silk boxing robe. Worn in the infamous first fight with Rocky when he pushes and kills Mickey. Also clearly seen in the ring as he ultimately wins the title. Some expected usage/wear and color fading to the silk due to age and filming, but otherwise in good condition. Still contains remnants of Rockys blood on the white collar! Robe comes complete with full documentation. Obtained directly from Frank Stallone. HERO CLUBBER LANG BOXING TRUNKS. T's iconic blue and white screen used Rocky III silk boxing trunks. Clearly seen worn in the ring as he ultimately wins the title from Rocky. 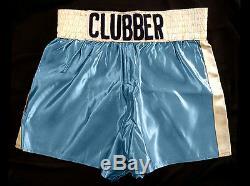 On the front waist of the blue silk shorts with white trim reads CLUBBER in black chain stitching. Trunks come complete with full documentation. 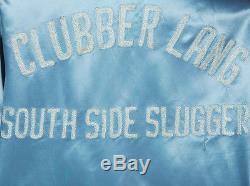 The seven letters ("CLUBBER") that are sewn on to the waistband of the trunks were done by hand. There are a number of sewing inconsistencies that match up perfectly to easily screen match. The letter "C" in CLUBBER is smaller than the letter "L". This can be clearly seen, as there is more white space between the bottom of the "C" and the bottom edge of the waistband compared with the amount of white space below the "L". There is very little white space below the "BB" in CLUBBER. In addition, the gap between the "U" and the "B" is also wider than the gap between all of the other letters. You can also notice that the irregular shape of the bottom of the white waistband matches up perfectly to the photo from the film. Finally, the size and shape of the hand-sewn letters also match up perfectly. Some expected usage, fading (Blue has become purple in places) and wear to the pieces, otherwise both items are in fine screen used condition. Enjoys the wealth and fame he has as world-champion. He only fights against opponents "hand-picked" by his manager Mickey Goldmill. Until being challenged by the arrogant Clubber Lang. Rocky accepts the challenge to prove once more that there is only one true world-champion. Lang destroys an unprepared Rocky taking the title and belt from the once great champion of the world. Hope and faith in Balboa fades, except for one man: former world-champion Apollo Creed. Creed tries to stimulate his fighting spirit... 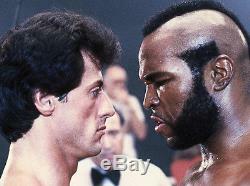 The Eye Of The Tiger and get Rocky back in top-form, will Rocky get his edge back to reclaim the title? 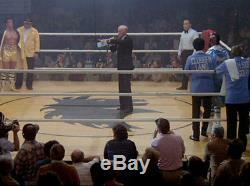 The item "Clubber Lang (Mr. T) screen used movie boxing robe & shorts Rocky 3 Stallone" is in sale since Wednesday, September 14, 2016. This item is in the category "Entertainment Memorabilia\Movie Memorabilia\Wardrobe\Originals". The seller is "emmettsauction" and is located in Los Angeles, California. This item can be shipped to United States.